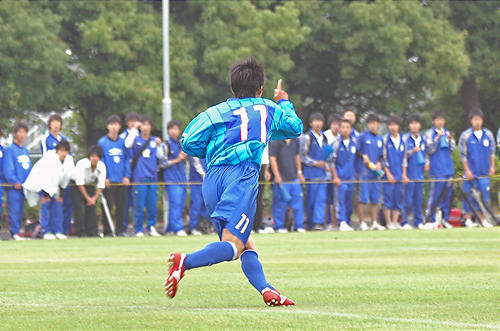 Seiritsu International Education: Soccer + the Japanese Summer = Hard Work! Soccer + the Japanese Summer = Hard Work! I arrived in Japan and went to school for only two weeks before the summer holidays began, and from what I had heard from teachers and friends, it gets reasonably hot Japan over the month and a half summer vacation. I’d just come from New Zealand where, in the summer, the weather would rarely go above 25 degrees. Thus when I was confronted by the Japanese summer it was something very new to me. Since I’m in the soccer club at Seiritsu, I had training six days per week with Monday normally off. For the first 2weeks training was hard but the weather hadn’t quite heated up yet so I was pretty happy. I’d have training in the morning, then play a bit of PS3, watch some TV, and maybe drink the occasional Starbucks Java Chip venti frappacino in the afternoon. In the 3rd week for 10days we did two trainings a day and during these 10days I really felt the power and ferociousness of the Japanese sun. It was relentless in making sure that I felt like collapsing at the end of each day. Then after this we went back to single trainings a day for the remaining weeks which I was extremely happy about! After experiencing such harsh and powerful heat and humidity, plus double trainings a day, you can start to appreciate the extreme fitness that the Japanese soccer players have and how hard it is to become accustomed to different weather. In New Zealand, when I would play soccer the temperature rarely snuck over 21degrees and the sky would most probably be overcast and I would easily last one game if not two. However, coming and starting to play in this summer in Japan, it was extremely hard for me to try and adjust to the new climate because I would tire out twice as fast when everybody else around me would seem to be fine. I knew it would be hard but not as hard as it turned out to be but now my body will be ready for next year and hopefully I won’t find it as hard as I did this summer!